I’m a digger, always have been… I dig until I uncover the facts, the truth is the only thing that stops me. Yesterday, I was doing what I love – uncovering the Progressives within The Sunlight Foundation, when I had an epiphany that rocked me. As all researchers will tell you, deep research is like putting together a puzzle, one piece at a time. Sometimes those pieces fall into place all at once, showing a picture of what you are dealing with as a whole and you are never the same. That’s what happened to me yesterday and it took my breath away. Soros has spread his money far and wide. He has created a myriad of Internet sources that actually are the polar opposite of what their titles indicate. He has masterfully placed Marxists on the boards of these companies – I see some of the same names over and over again. He now has people everywhere that are following a set Progressive/Marxist agenda. It’s like the mob – once you take his money and his people, the only way out is a toe tag either for the business or you. I have been at this long enough that I can ferret out facts found on these sites and still glean info from them. But sometimes, they fool even me. This is a warning to my fellow researchers out there – Soros basically owns the majority of information sources on the web. Even if the company claims they are neutral, by taking his funds funneled through various layers of foundations, they have opened themselves up to the potential of influence and corruption. They are tainted. The Soros Files shows this wonderfully, as does Keywiki. I want to lay out the Soros Media Network for you next and this makes my stomach curl in on itself. A special thanks to Trevor Loudon of New Zeal and Cliff Kincaid of America’s Survival, Inc. for their excellent documentation and research on The Soros Files. DirecTV (channel 348) and part-time on 200 cable affiliates in 39 states. $1.8 million from Open Society Foundations in 2010. 10.6% from CPB. 900 stations. Project Syndicate: distributes commentaries from George Soros and Joseph Stiglitz to 474 leading newspapers in 151 countries. As you can see from the list above, Soros has his fingers in everybody’s pie. The old spider is crafty and evil as hell and won’t quit until he collapses the US and he is doing a fine job so far. Notice the deceit in the names – black is white here and transparency does not exist in reality. They claim to be transparent and non-partisan, but they are anything but that. Tread carefully on the web. Vet your information thoroughly, check every detail. It’s like dancing with the devil who is promising you heaven and earth. You can’t believe anything you see or read at first blush. 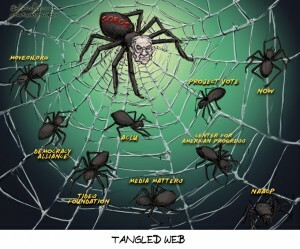 Don’t get snared in the Soros web.